In a world filled with backup solutions, you’d think there isn’t space for another application. Think again though – RegShot has the advantage of being both free and open-source, not to mention an excellent solution if you’re looking for an application that does just that – backup your registry. This particular utility is a terrific aid when it comes to checking changes that have appeared in your registry database. We all know the Windows registry is in constant change thanks to the applications we keep installing therefore keeping track of these changes is essential for quality maintenance. This small, open-source utility can be a great asset when tracking changes that occur due to different system changes – such as installing new software. In other words, you can take a snapshot before and after installing new software and see exactly what changed. 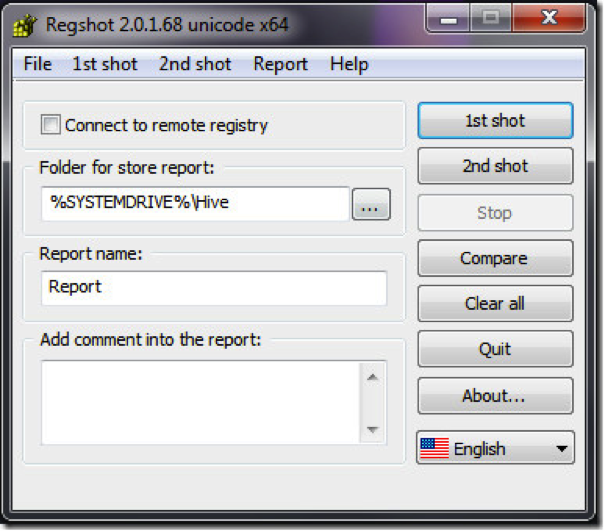 Nowadays, there is even an extended version of RegShot that works nicely on Windows Vista and Windows 7, and even better – it finally works on 64-bit systems. Most registry beginners wouldn’t be able to see the difference between the two versions, however it’s essential to understand that this particular system finally checks the entire registry system. The biggest problem when installing the app is that it comes in Russian, but as you can see in the snapshot above, changing language isn’t all that hard. Afterwards, it’s all quite simple. You first click the 1st Shot button, which you can see highlighted in the snapshot and save it to a file of your choosing. You continue by performing all the system changes you had in mind and then go for the 2nd Shot. Your output file should be generated at this point and you can access it by clicking Compare. And this concludes the report of your registry before and after the changes. The RegShot can be downloaded from sourceforge.net/projects/regshot.